In addition to the front of the bastion of the sixteenth century, long 11 kilometers, Padua retains some of the old walled city (XII e XIII Secolo) with two doors and the Castle, as well as traces of the fourteenth century Carrara, this “old walls”. According to the sources, already among the 1195 and the 1210, the first defensive ring was closed. In 1242 Ezzelino III da Romano began building the fence Castle S. Tommaso with Torlonga, at the bifurcation fluvial input in city. Ubertino of Carrara (1338-45) as well as undertake the construction of the building and its connection with the hanging walls municipal (Ferry), built a second round of walls, to defend even the new urban development outside the island city, Francesco da Carrara while I did incorporate a third line of fortifications also the two villages of S. Cross and All Saints, which extend towards the south and east. This city walls became inadequate to the defense of the city. After the defeat of the Agnadello 1509, Venice ordered to strengthen the defenses of Padua and Treviso: were initially constructed temporary structures, designed by Fra’ Jocund. The final fortifications were built only from 1513, on a project conceived and directed until 1515 by Captain Bartolomeo d'Alviano. One can distinguish five phases of construction: from 1513 to the 1515: the construction of a circular bastions of the Impossible, the Gate, by Longtail (or Gatta) and the Old Door (o Buovo), the excavation of the pit and the raising of the curtain between S. Cross and Pontecorvo, with salient S. Justina must Bartolomeo d'Alviano; from 1515 to the 1523: Angelo Mariani and Sebastian Buovo completed works designed by Bartolomeo d'Alviano. It opened the doors of Pontecorvo (o Liviana), di S. Cross and All Saints (Hatch) and they built the towers of the New Door (the Venier), dell'Alicorno, of Porciglia (or the Arena) and the Bastion of Castelnuovo (of Gradenigo). They dug ditches and erected the curtain between All Saints and Porciglia and between the gate valve and the Alicorno, col bastioncello Ghirlanda; from 1523 to the 1530: the new captain of the Venetian Francesco Maria della Rovere supervised by 1526 the construction of the first three pentagonal bastions of S. Prosdocimo, S. John and Savonarola. In 1528 and in 1530 opened the doors of S. John Savonarola and the Veronese architect Giovanni Maria Falconetto; from 1531 to the 1532: Captain John Brown he completed the two bastions that bear his name. Perhaps designed by Della Rovere, are placed on the salient, determining a new route masonry star, amending for the first time that of Alviano; from 1532 to the 1556: Sanmicheli built the bulwark between the Cornaro 1539 and the 1540, the largest in the circuit fortified Padua. The two squares low hemicycle intercommunicate by means of a tunnel. Similar to the Cornaro, Bulwark of the S. Cross was built between 1548 and the 1554 leaning against the curtain near the door existing. - Door Hatch (externally visible – Internal partially open). - Door of the Holy Cross (externally visible – Internal partially open). - Porta Savonarola (only externally visible). - Bastion Alicorno (externally visible – internal visited during the events of the neighborhood). - Bastione S.Croce (externally visible – internal visited during the events of the neighborhood). - Bastion Old Door (only externally visible). - Porta Pontecorvo (only externally visible). - Porta Altinate (only externally visible). - Mill Gate Bridge (only externally visible). - Palazzo del Bo (from March to October: Monday, Wednesday and Friday :15,15 – 16,15 – 17,15 – Tuesday, Thursday and Saturday: 9,15 – 10,15 – 11:15. From November febbraio: Monday, Wednesday and Friday: 15,15 – 16:15 – Tuesday, Thursday and Saturday: 10,15 – 11,15. E’ Reservations are recommended at 049 8273047). - Scrovegni Chapel (reservations required at 049 2010020). - Basilica of S. Anthony (6,20 – 19,00 – with daylight saving time 6,20 – 19,45). - Basilica of S. Giustina. - Baptistery of the Cathedral. - Church of the Hermits. - Church of St. Francis. - Church of St. Cajetan. - Church of St. Luke. - Church of S. Aria del Carmine. - Church of Santa Maria dei Servi. - Church of San Massimo. - Church of S. Sofia. - Church of S. Nicholas. - Oratory of St. George and the School of the Holy. - Oratory of San Michele (from 1 October to 31 May Tuesday to Friday 10,00 – 13,00 – Saturday and Sunday 15,00 – 18,00. - From 1 June to 30 September – Tuesday to Friday 10,00 – 13,00 – Saturday and Sunday 16,00 – 19,00. Closed on Mondays, 25 and 26 December, 1 January and 1 May). - Oratorio di San Rocco (9,30 – 12,30 / 15,30 – 19,00. Closed on Mondays, 25 and 26 December, 1 January, 1 May). - Palazzo della Ragione (yes Martedì of Domenica 09,00 – 19,00 – from 1 February to 31 October 09,00 – 18,00. Closed on Mondays, 25 and 26 December, 1 January, 1 May). - Pedrocchi Cafe (externally visible – The main floor is open: 9,30 – 12,30 / 15:30 – 18:00. Closed on Mondays, 25 and 26 December, 1 January, 1May Day). - Loggia and Odeo Corsaro: Tuesday to Friday 10,00 – 13,00 - Saturday and Sunday 10,00 – 13,00 and 15,00 – 18,00 - Put 1 ° novembre al- 31 January – 16,00 – 19,00). - Tomb of Antenor (externally visible). - Clock Tower (externally visible). - Loggia Amulea (externally visible). 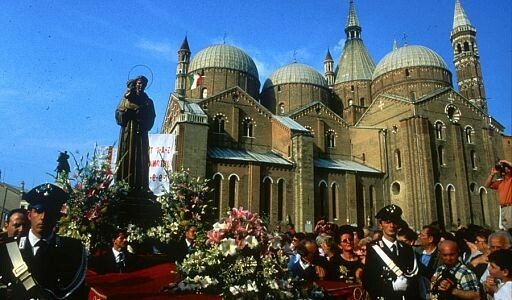 - Procession of St. Anthony – 13 June. - Various events are organized during the year. born the function of house Imprisonment, can be visited by appointment (such. 049/8293469) the tower of the Observatory of the Astronomical Observatory, built by 1767 sopra la Torlonga duecentesca. From the square you cross the bridge, from which you have an overview of the castle, to recross the Tronco Maestro on the great thirteenth-century stone arch bridge S. Augustine. Continuing along the coast Mussatus, meet some sections of the curtain wall, high more than ten meters wide and more than three, built with horizontal courses of stone with brick bricks alternating trachytic. Of 19 door, four (two of which are conserved) were the main, those opposed to the cardinal points. Always following the watercourse, meets the thirteenth-century Ponte dei Tadi, after which there is the iron footbridge S. Blessed. Then the river turns east and north facing walls are. He then meets the Bridge S. Leonardo, until you reach the door of the Mills, that closed the city walls to the north, outside of which is the Ponte Molino (nineteenth-century reconstruction of a Roman bridge). Beyond the bridge is a surveillance tower, said Ezzellino. It continues by Dante, leading into Piazza dei Signori, heart of the city. You enter to the right of the Palace in Carrara, time Difesa the walls, through the door of the Palace of the Captain is located in Piazza Capitaniato, the building of Liviano, Sala dei rewarded, while away from Accademia Carrara reaches the Loggia. Then we arrive in Piazza Duomo, where is located the complex of the Cathedral, with the Baptistry and the pawnshop. Back in the Piazza dei Signori, Turn right until you reach the western side of the Palazzo della Ragione, (XIII del Secolo), separating the squares of Fruits and Herbs. Lined the whole of the Town Hall, turn left, to the intersection with Via S. Lucia, where, on the right, opens the second port city remained, Porta Altinate east. The visit of the opposite bastion of Padua, long 11 km, It takes about half a day of time with a suitable means of transport (should the bike to its flexibility in frequent stops). The Association Committee Walls of Padua organizes guided tours for groups (Tel. : 049 8717530 – 8753371, Fax 049 8776077 for reservations). The departure can be fixed to the door steps of the new, the mooring of boats from Venice, in front of the monumental exterior facade of Porta Ognissanti. Here comes the Bridge Fistomba a bike path that runs along the left bank of the canal and continue along Via Trieste Piovego, where, crossed the footbridge, Bastion meets the Small and the strut with Porciglia within the art school Peter Wild, Already Slaughterhouse-century architect G. Jappelli. Walked into town, You can walk through the gardens with the Roman Arena Bastion, and the Scrovegni Chapel and the Civic Museum of the Hermits, along the bike path via Giotto, the end of which, over the bridge of the closed doors of Contarine and the Bridge of the Carmine (a brief digression within the city leads to the Church of S. Maria del Carmine, Scoletta with the precious frescoes in the sixteenth century,(i) Turn right into driveway Longtail and then left into Via Sarpi around the Tower Longtail. Along the ring road you meet all below the ramparts of the area north and west: Moro I, Moro II, Impossible, Savonarola, preceded by the homonymous port G. M. Falconetto, S. And S Prosdocimo. John, Early the other door Falconetto, where it is being set up a visitor center with models of the walls and of the siege of 1509. When you reach the bastion of the gate valve that, port with the same name (replaced by the current gap) and the small bastion of the Chain, constituted the control point of entry into the city of vessels. Just to the north lie the remains in the same barrage medieval (Tower of the Chain, with the fence of the Gate of Relief, visible beyond the river, from the Riviera Paleocapa. 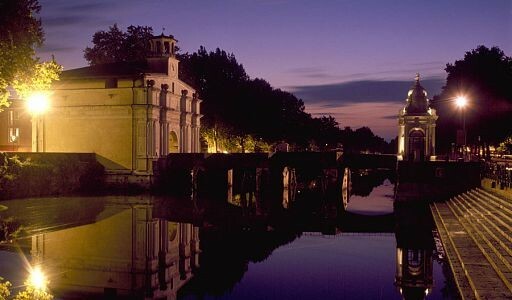 Walked into town to the bridge via Paoli, it runs along the parapet on the embankment planted with trees within the walls, overcoming the Bastion Tower Garland until Alicorno, the extreme south of the city sixteenth, where you can visit the impressive interiors of booking. Leaving, continue on the embankment to the east, going down to the square S. Cross and, with your Margera, Door to S. Cross, next to the last bastion built in Padua. Following again the outer ring (via G. Bruno and your A. Manzoni) meet the towers of S. Giustina, from which you can see the Church of S. Giustina (the), and Ponte Corvo, on top of a short strut, and the Porta Liviana. It then enters the city, along via S. Francis left the note on the back of the Basilica of S. Anthony,(m) and then turn right on Via Ospedale Civile, which continues in via S. Maximum. From here a short digression on the right for the bridge and the breach of Cornaro street leading to the great bulwark of the Cornaro San Micheli. We then proceed via S. Maximum, to turn left into Via Orus, where he began a visit to the eastern end of the front bastion with Tower Buovo south, Castelnuovo and its water door. Leaving for the breach of All Saints and the bridge Fistomba, you cross to the left bank of the channel Piovego, in view of the Tower Venier, until you return to the steps of the door. Communities: The Territory is divided into 6 neighborhoods.